From Halifax, Nova Scotia, to Orlando, back to the East Coast and currently holding ground in Toronto, producer/engineer Laurence Currie has produced some of the coolest (yes, coolest) albums that Canada has seen in the past two decades. Sloan, The Gandharvas, and Holy F@#k's debut album that caused a stir. After graduating in '93 with a business degree and a minor in music, Currie crossed the border to learn more at Full Sail Center for the Recording Arts in Orlando. It was then back to Halifax in '94 doing sales and radio promotion for an indie record label. At night and on weekends, Currie started doing demos for bands in different studios in town which included Thursh Hermit, Sloan, The Super Friendz, etc. If you know these bands, you know what a hotbed of pop music the Canadian East Coast was in the '90s. 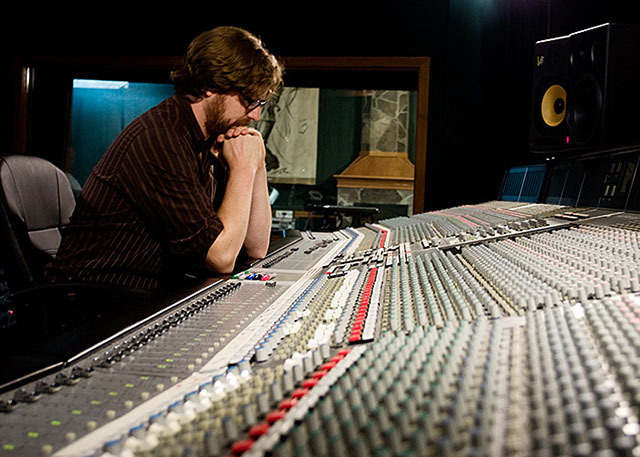 Currie eventually opened his own studio Idea Of East Recording in Halifax until 2005, when he then packed up and moved to Toronto (just as many of those East Coast bands had done earlier) where he currently produces. He is also a co-host (with producer Moe Berg) for the choice TV/web show Master Tracks. You are totally responsible for whatever you are hired to "produce" ( a song, LP, EP) and all that entails. On any given session you may have to be an arranger, accountant, manager, psychiatrist, musician, sociologist, engineer, promoter, agent, etc... You end up wearing a lot of hats. The main "jobs" tend to be: work on the song arrangements, hire the studios, hire engineers, hire session players, hire technical crews (if necessary), pick the songs, quality control, make sure the record is made on time and on budget, along with keeping both the artists and the record companies (if there is one) vision of the record intact. 2. How long have been producing? 3. Who are the some of the most noteworthy artists you've produced in the past? 4. What are you currently working on in the studio? As of today, I just finished up an EP with a local band (Toronto) called Little City who sort of do a wonderful mix of folk/ roots and a classical thing with a great female vocalist. I'm finishing up the mixes on a record with a band from Newfoundland called Mercy The Sexton. I can only describe them as sort of Devo meets T.Rex with a little Flaming Lips thrown in. I've also finished tracking a new band from New Brunswick (as of publication they don't have a name) who are going down the sort of Bloc Party meets The Dead Weather. So it's very interesting musically, but also dirty at the same time. And I have a band up from Nova Scotia called Gloryhound...very rock...very cool, Ramones meets Mott The Hoople. We just finished the beds on that this week. 5. Do you mainly work out of one studio or do you go where a band needs you? I do have my own place that I love to track vocals and overdubs in. It's also my main mixing facility. But, I tend to travel a lot so I have to work in many different facilities. Honestly, I wouldn't have it any other way. There are so many great recording rooms out there with different gear and specialties. It's just fun and interesting to work in many places. Also, there are budgets to consider. 6. How do you know if you, as a producer are a good match for a band? Funny enough, these days, I know in about five minutes of meeting them or talking to them by email. You can get a sense really quickly if you’re going to be able to help someone out or not. Or, if they'll be open to constructive criticism or not. Or, if you're even going to get along. In my career, fortunately, it rarely has happened that I didn't get along with a band, but it has happened. 7. What's the best piece of advice you'd give a band who thinks they are ready to record? Don't record yet...wait. Seriously though, make absolutely sure you are ready before spending that kind of money. Record your stuff around one microphone (if you're that type of band) into your laptop and see if it sounds good, or sounds like crap. If it sounds like crap, you probably aren't ready to spend your money on hiring a producer yet. But, once it doesn't sound like crap, a producer may very well be able to help you out. But, more importantly, play shows. Learn to entertain. Learn to promote yourselves. These are going to be more important skills you will need before you even decide to hit a record button. For some odd reason, new bands seem to think that recording something is the first thing to do. In actuality, it's the last. 8. What kind of inside experience does being a musician yourself help with producing? It gives you an intimate sense of the instrument and what it can do. It also gives you empathy when dealing with a player. Which, can sometimes be very important. Plus, it obviously makes showing people parts a lot easier. 9. What is your favorite thing about producing? Working with very gifted and talented people. It's inspiring. 10. What is your least favorite thing about producing? The business end of things. Right now, the industry is in such turmoil with no real end in sight. It makes it difficult on artists, producers, engineers and studios (all the creative end) to be able to get a group of really talented people together in the same place at the same time, which has traditionally been the way to make truly great music. It's part of the reason that technology is taking up the slack. You need to be able to make things cheaper. Cheaper isn't always better. 11. In addition the albums you are working on, what current albums have you been listening to lately? Funny...besides buying CDs (yes I still buy CDs, they are the only affordable medium right now that gives me reference quality music), Broken Social Scene's new record and albums from The Dead Weather, Band Of Horses, and The National, I recently got the reissue of Exile On Main Street (the Rolling Stones). It's still a great record and the extra tracks are actually pretty good. The Other Side highlights those talented and very important folks behind the scenes of the music that we listen to. The Other Side will feature producers, engineers, booking agents, band photographers, online radio DJs, etc. It's pretty awesome.